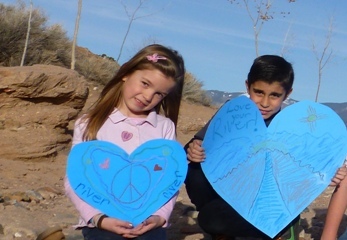 Early education of our students about the watershed and its significance to the City of Santa Fe is critical and requires continued support. It has been my pleasure to support continued funding of the program and to work with the Watershed Association on this over the years that I have served on City Council. I think that this is an outstanding program which shows how environmental science can be made relevant to the youth of the community by showing them how the conclusions of this type of scientific investigation can directly affect their lives. This special SFPS school program is free and funded by the City of Santa Fe. It’s a three-day program comprised of: 1) a one-hour classroom session devoted to planning a field visit to the city’s upper watershed; 2) a full-day field trip to the upper watershed to practice observation and data collection (sampling macroinvertebrates in the Santa Fe River); and 3) one-hour debrief on the field visit and re-cap of where our water comes from. This program is quite consistent with our water conservation public education campaign where school students are a major constituency in our community with regard to understanding our water issues and to eventually be responsible stewards of our precious, limited supply of water. I applaud the program. As a community, and as nation, education of our children on issues that will determine the quality of their life is critical. Yes! This is an excellent program. This program is sometimes the first chance for some children to experience anything close to the natural world— a place without houses and cars and stores. In addition, science-based education is extremely important, and we need to expand experiential learning opportunities. I wholeheartedly support reinstating City support for this program to the level of the number of classes that were being served before as soon as possible, and working on expanding the program to serve more students.